Welsh rugby stars have expressed their support for the LGBT community after comments made by Australian international Israel Folau. World Champions Wales Deaf Rugby are launching a recruitment campaign to set up a new women and girls side. Navidi dislocated his elbow in the Cardiff Blues' victory over the Scarlets - six days after helping Wales complete a Grand Slam. The second row captained Wales to victory in this year’s Championship securing their first Grand Slam since 2012. Welsh rugby will continue to be represented by the same four regions for the 2020-2021 season after a merger was ruled out. It's been a Six Nations to remember - particularly so for 82-year-old Maureen McColl. 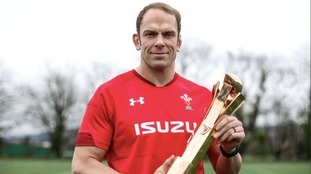 Wales will head to Japan in September as Six Nations champions, Triple Crown and Grand Slam winners. The young fan was at his first international game when an Irish supporter gave him a t-shirt thrown into the crowd by the man of the match.